"Sheila, Haw sad for you losing your Don. Knowing how hard..."
"Don was the age of my brother, Ron Vogel (now deceased). I..."
Donald D. Cardon, 83, of Mesa, Arizona, died on Saturday, December 16, 2017 from complications following hip replacement surgery. Born in Camas, Washington, on March 23, 1934, to Lon and Thelma Cardon, Don attended Fort Vancouver High School, and entered the United States Navy in 1951, where he served on the USS Point Cruz during the Korean War. Following his military service Don formed his own companies, both in construction and real estate. He eventually went to work for HUD, where he retired as the Deputy Executive Director in Kitsap County in 1997. Don enjoyed numerous activities with his wife and four children, including camping, fishing, and waterskiing. He was also active in Kiwanis, Elks, and Little League in Vancouver, WA - where he coached his son, DJ. He, and his wife Sheila, enjoyed hunting, bowling, and golfing together for many years. Don loved spending time with a wide circle of family and friends, whom he told his numerous jokes and stories, and sang his silly songs. 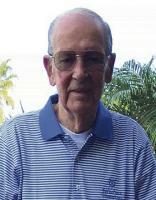 For the past twenty years Don lived in Mesa, Arizona, with his wife, where they enjoyed many happy days on the golf course next to their home. They would have celebrated their 65th wedding anniversary in February. Donald is survived by his wife, Sheila Cardon; three of his four adult children, Victoria Lindstrom; Dorene Cardon Cortnik; Donald (DJ) Cardon; and eleven grandchildren - as well as his brothers, Bob Cardon, and Ken Cardon. He was preceded in death by his daughter, Karla Cardon, and his sister, Betty Witt-Bridger. A military service tribute was held on Friday, December 22, 2017, at the National Memorial Cemetery of Arizona in Phoenix.